Social commentary is a traditional feature of literature, but with Millennials coming of age, outspoken hypothesising on the state of the world looks to become a staple of modern story telling. This year’s Ockham’s shortlist highlights this. A solipsistic tale of youth and immediacy, an immigrant’s lot in today’s NZ and Gen Xers pitted against Millennials make up three quarters of the shortlist. 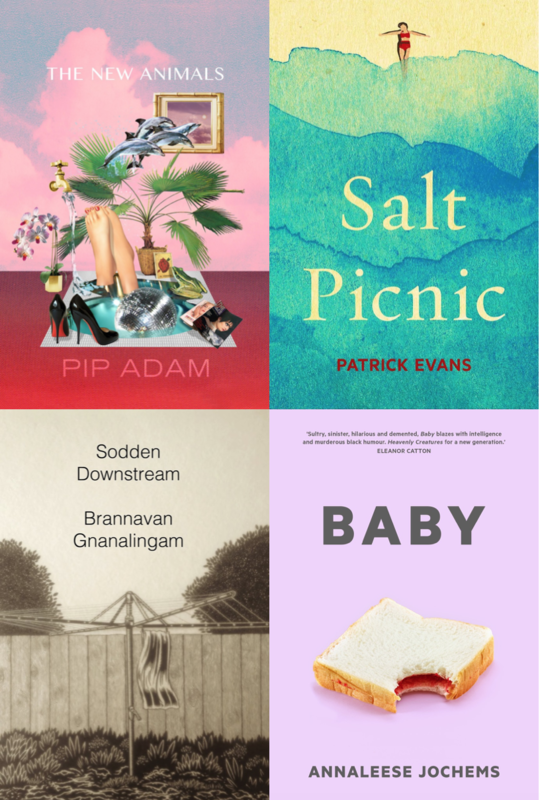 Salt Picnic breaks the mold with a highly academic look at two years of Janet Frame’s life written by a stronghold in the NZ fiction world. However, it’s complexity and bravado keeps it under the indulgent umbrella. However, with time and contemplation, us couple of Gen Xers were able to see through the decadence and accept where these novels had hit the mark, even when we felt they were slightly annoying or unconnected to us. Our summations: Salt Picnic is a very literary book that should be recognised but has a limited audience. Sodden Downstream portrays a slice of NZ that people may or may not agree with, but no one can deny the book’s haunting atmosphere. Our views differed on the remaining two books, Suzy was more captured than Rachel by both. Though we did agree The New Animals had two parts (one which was superb) that didn’t really connect with one another. And that Baby was either brilliant or brilliantly annoying. We wondered if this surmounted to the same thing … but what we did agree on was that Jochems is someone to watch. In the end it came down to two books: Baby and Sodden Downstream. Baby hits all the checkpoints in a vernacular which young adult readers in particular will gravitate towards. Sodden Downstream paints a gritty, moody picture of NZ’s social climate that advocates for the dispossessed in particular will love. It depends whether you like your books perfected, as VUP books tend to be, or something less highly polished. Suzy and Rachel concluded in this instance we preferred the rawness of Sodden Downstream and as such have earmarked it as our preference for the win at this year’s Ockham Book Awards. But we wouldn’t be surprised if the new talent of Annaleese Jochems takes it out.